It's one of the smallest pack in the Timber Hawk line, but the Gut Hook 3.0 is huge in performance. Just going out for a couple of hours? This model is perfect for hunters who prefer to travel light, and the compression straps allow the user to secure items externally, such as a jacket or knife. This one was designed with the old Boy Scout motto in mind: 'Be Prepared. Fully padded air chamber back panel and waist belt. 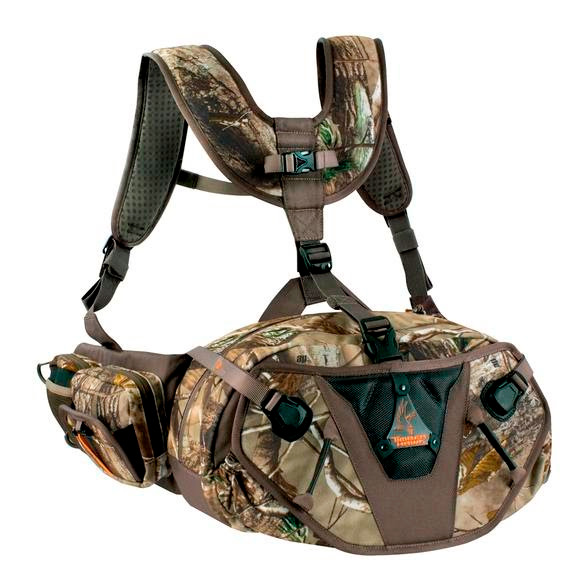 Padded adjustable shoulder harness for load distribution. Multiple compression straps and adjust points for maximum comfort. Multiple Internal zippered pockets and organizing panels for small gear. Timber Hawk&apos;s innovative new Hawk-Eye system allows hunters to easily fasten binoculars directly to the shoulder straps for the ultimate in accessibility and weight distribution. When the pack is taken off, the straps remain on the binos so they can be worn around the neck or over the shoulder.